The road closure will be managed as it was in October. 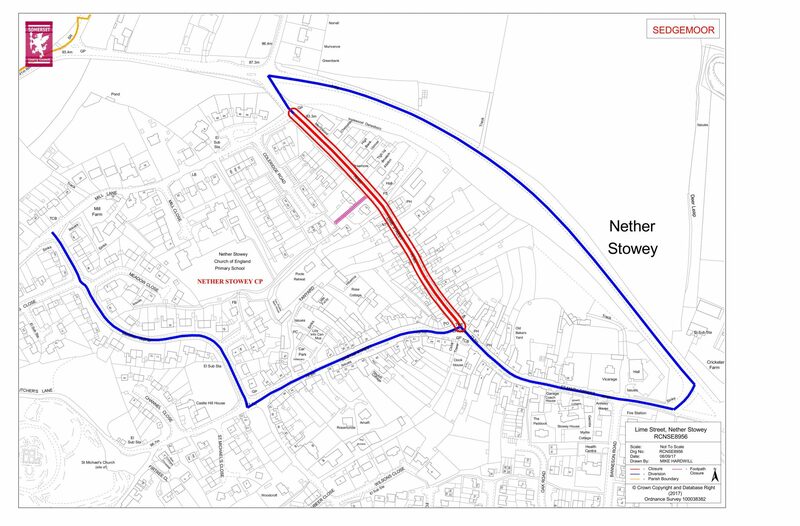 A traffic manager will be on site during the works and will allow access to residents and businesses whilst the works are in progress and when it is safe to do so. This may mean waiting, for example, while machinery is operating by the road. This for your own safety and that of those working on the site. (eg coned or fenced off). There will be no further trees removed from the bank on the south. Further work on trimming the trees around the power cable pole. This is under discussion between Somerset County Council (SCC) and Western Power. There will be some trimming of the trees on the north side of Lime Street on Highways land where this is necessary for the scheme (detail to be decided on site). Wider Area – click ^ in the top right-hand corner to minimise the information box!